Today I would like to talk to you about another plant well known for its stinging abilities, but less known for its extraordinary healing properties: nettle . The nettle is a plant that grows luxuriant at the edge of the woods, in the countryside and in uncultivated fields. It is said that it grows only in unpolluted places, so if you find it near your home it is a good sign. It is a precious plant, both from the medicinal point of view and from the culinary point of view . Our grandmothers knew her well and often used it instead of spinach to prepare delicious omelettes, risottos and filled tortelli. And they did well to cook it and eat it, because the nettle does it very well to prevent and treat many ailments. 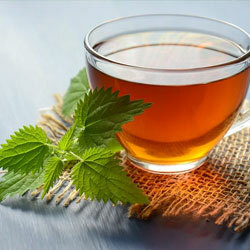 Since ancient times, nettle has been associated with excellent diuretic and purifying properties. Historically it was used and recommended in tisane, or as a vegetable, to be taken after the holidays and the great binges, to purify and detoxify the body from the accumulation of toxins. In fact, the nettle works by promoting the elimination of waste and uric acids , thereby also lightening the work of the kidneys and the liver. Moreover, thanks to its ability to promote the elimination of uric acids, it is a plant very suitable for people suffering from gout and rheumatic pains , especially when combined with other plants with similar properties, such as horsetail and blackcurrant . Together with epilobium parviflorum , bee pollen and aloe arborescens juice , nettle is among the most suitable plants for the treatment of prostate disorders (prostatitis, prostatic hypertrophy, prostate cancer, etc.). Its effectiveness is thought to be due to the high content of antioxidant and anti-inflammatory principles, such as phytosterols, lignans and polysaccharides . Several studies have been carried out on the nettle, which show that nettle extract is active against benign prostatic hypertrophy, a benign tumor form very common in men over 60 years of age. For example, this 2005 study [ 1 ] conducted on 287 patients with benign prostatic hypertrophy treated with nettle extract (Urtica dioica) showed a significant reduction in symptoms, serum PSA and prostate size. For example this double-czech study [ 2 ], conducted on 100 patients with benign prostatic hypertrophy. Also in this study we have seen how the patients who have been given nettle have had significant improvements in the symptoms, compared to those who had instead taken a placebo. Thanks to its restorative and re-mineralizing properties , nettle is a safe remedy for anemic people , people who are tired or down-toned and for all those people who are in a period of convalescence , due to heavy therapies (for example after chemotherapy), or after a long period of illness. Taken as a vegetable, or as an infusion, nettle acts on the bone marrow, stimulating the production of new red blood cells . This particular action seems to be due to the richness of chlorophyll, as well as mineral salts such as iron, magnesium, calcium, etc. In fact it is no coincidence that the chemical formula of chlorophyll, in fact, is very similar to that of human hemoglobin, from which it differs only for an atom. There are several studies that show how nettle leaves are also effective for regularizing blood glucose levels (glycemia) in people with type 2 diabetes. For example this study  conducted in double Czech on patients with advanced type 2 diabetes mellitus. In the 3-month study, one capsule containing 500 mg of extracted nettle leaves was administered every 8 hours without altering the administration of normal anti-diabetic drugs. At the end of the test it was found that nettle extract was effective in lowering fasting blood glucose levels, 2 hours postprandial glucose and HbA1c significantly and without side effects. If you suffer from diarrhea , in case of need remember the nettle. Taken as an herbal tea, thanks to its astringent action (property due to the presence of tannins) it is certainly effective to stop this annoying and unwelcome symptom. Alternatively you can use ginger , or rosehip . Frequent blood loss from the nose. In all these cases you can help by drinking 2-3 cups of nettle infusion a day. Did you know that taken during breast-feeding, the nettle tea and the consumption of nettle as a vegetable, increases the production of breast milk ? Together with fennel seeds , milk thistle and carrots, nettle is one of the most suitable plants to stimulate the milk whites. It is no coincidence that the farmers - at least those of the past, - used to feed nettle leaves to their cows, to double the milk production. 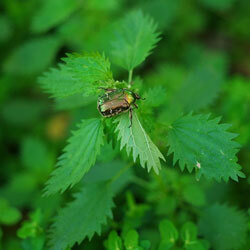 The period of collection of nettle leaves is in spring , before flowering. For culinary purposes only the tops are picked up, which are more tender, while for the preparation of the teas the whole plant is fine. Generally the nettle is cooked like spinach. Then, first it is lightly cooked and then sautéed in a pan with oil, salt, garlic, chilli pepper and other spices. Excellent in combination with rice, or to prepare delicious omelettes. The herbal tea is prepared by putting in hot water, about a teaspoon of dried herbs (2 teaspoons if it is fresh nettle). It is left to stand for 8-10 minutes and then filtered. Recommended from 2 to 4 cups a day. Warning! If you want to collect the nettle take care to wear a pair of gloves, since the whole plant has some stinging peels able to release substances such as histamine and acetylcholine, which irritate the skin. After drying or cooking, the nettle loses its striking properties. It is not recommended during pregnancy, because it stimulates the motility of the uterus, while it can be taken during the lactation phase. In our "health garden" could not miss the nettle, officinal herb that we grow along with many others ( see the list of all teas ), in the open countryside in Fermo. 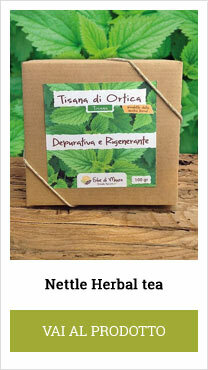 Click here to order the nettle of Erbe di Mauro in the form of herbal tea. NB: Tutte le informazioni pubblicate su questo sito hanno carattere divulgativo e non devono essere considerate come consulenze, o prescrizioni mediche, o di altra natura. Fascinated by the many beneficial and healing properties of these plants and after having used them for a long time, today, with the help of my family, I cultivate with passion Aloe Arborescens, Aloe Vera and many other aromatic and medicinal plants. My philosophy is simple, it is to offer the highest quality of raw materials and to use exclusively artisan processes to produce my products. Rules seemingly simple, which serve to get the most out of my plants and my products.